Bubble: Displays a set of three variables and presents them as scattered bubbles. The third dimension is the size of a bubble. 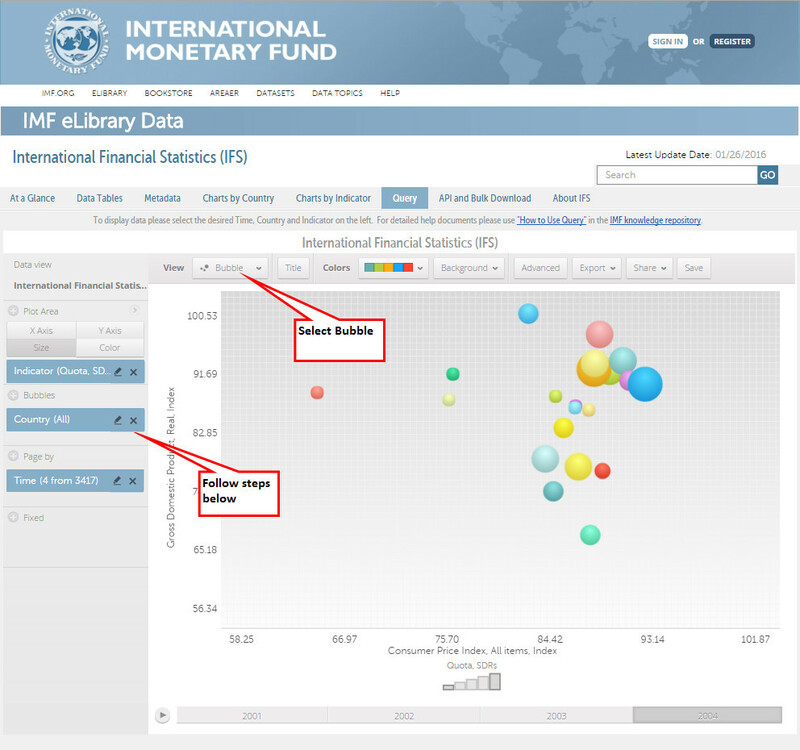 Bubble chart Instructions - The sample chart uses the International Financial Statistics dataset. For Advanced Economies countries the chart plots GDP, Real, Index against CPI, All Items, Index; the size of the bubbles denotes the amount of Quota in SDRs; it shows the years : 2001, 2002, 2003, and 2004. Click on X Axis so it is shaded. Click on the plus sign next to Plot Area and select Indicator. In the pop up dialogue box search for Consumer Price Index, All Items, Index; select and click GO. Click on Y Axis so it is shaded. In the pop up dialogue box search for Gross Domestic Product, Real, Index; select and click GO. Click on Size so it is shaded. In the pop up dialogue box search for Quota, SDRs; select and click GO. Click on the plus sign next to Bubbles and select Country. Place cursor somewhere in the gray area of the pop up dialogue box and right click. Mouse over Group and click to select Advanced Economies . From the pop up dialogue box select All Items on the Screen. Click Apply and OK.
From the pop up dialogue select 2001, 2002, 2003, and 2004. Click Apply and OK.